VW has committed even further to the sub-Saharan African region, signing a memorandum of understanding with Ghana to create a vehicle assembly facility in that country. 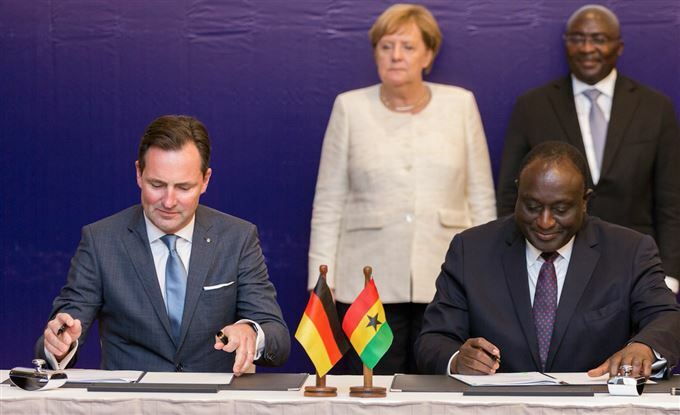 Thomas Schaefer, Head of the Sub-Saharan Region for VW together with the Ghanaian Minister of Trade and Industry, Alan Kyerenmaten signed the MOU with German Chancellor Angela Merkel, Mahamudu Bawumia, Vice-President of the Republic of Ghana. This would also include developing a fully-fledged sales and service network in Ghana as well as establishing a Training Academy for Production and After Sales. Volkswagen will now begin a feasibility study for an integrated mobility solution, which includes a review of the commercial viability of introducing car sharing, ride hailing and shuttle services by way of a Ghanaian subsidiary of VWSA, or the appointment of a local service provider. The Ghanaian Government will simultaneously begin to develop a comprehensive Automotive Industry Policy, which will incentivise and facilitate vehicle manufacturing and assembly in the country – including a preferential procurement policy for locally assembled vehicles. Volkswagen has a fully-fledged manufacturing facility in South Africa and assembles vehicles in Kenya, Nigeria and most recently in Rwanda in conjunction with an Integrated Mobility Solution, offering Community Car Sharing and shortly to be launched Ride Hailing. The first locally assembled vehicles are planned to be on the streets in Accra in early 2019.Schaefer. The latest agreement forms part of the automaker’s TRANSFORM 2025+ brand strategy, in which it aims to strengthen the regions and focus on new up-and-coming markets. VW explains that alongside North and South America as well as China, the Sub-Sahara region plays an increasingly important role. Although the African automotive market is comparatively small at present, the region is expected to develop into an automotive growth market of the future. Volkswagen has been in Ghana for the past 20 years with Universal Motors Limited (UML) operating as its licensed importer since 2005.